Thinking of heading to the Koh Phangan full moon party? At the Koh Phangan Full Moon party expect to have a night of full on partying!! It is not for those travelling alone or a place for the feint hearted and if you do not like crowds of people dancing to loud music, then would be best to give this a miss. Located near Koh Samui it is a place where 98% of the party goers are set for a night of drinking, partying and sexing, then if you are here to relax and have a bit of a dance then it probably isn’t the place for you. Basically, if you want to get drunk, while dancing and monkeying around on a tropical island beach, then this is the place for you. Saying that, you still have to be responsible, polite and be wary of what you are doing or this might turn into a night you will never forget for the wrong reasons. 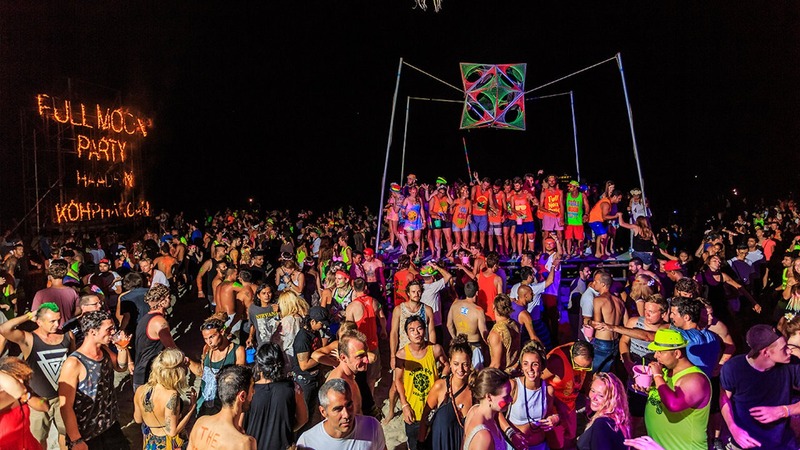 Here a few tips for you to follow while attending a Full Moon Party. Go in a group and stick together throughout the night. Especially if you are Female. Bring a small bag that holds, appropriate footwear, sunscreen, condoms etc. Be wary of thieves and people trying to take advantage of you. Do not pass out on the beach from over drinking. Have fun!!!! That’s what you are there for. Drugs and crime are prevalent on these nights and even though you would be crazy to purchase and use the drugs (under cover police are everywhere on the beach) but you may also be ripped off with imitation drugs. There is enough fun to have on the cheap, tasty alcoholic buckets, which are easy to buy at a very good price.